While you can debate about the exact role of social media, specifically Twitter and Facebook, in Egypt’s revolution, there is no question about its role as a new global media channel. Where once people tuned into CNN to watch governments collapse, this time around they tuned into Al Jazeera on the Web (at least in English speaking countries lie the U.S. where Al Jazeera English is not widely carried on cable systems). 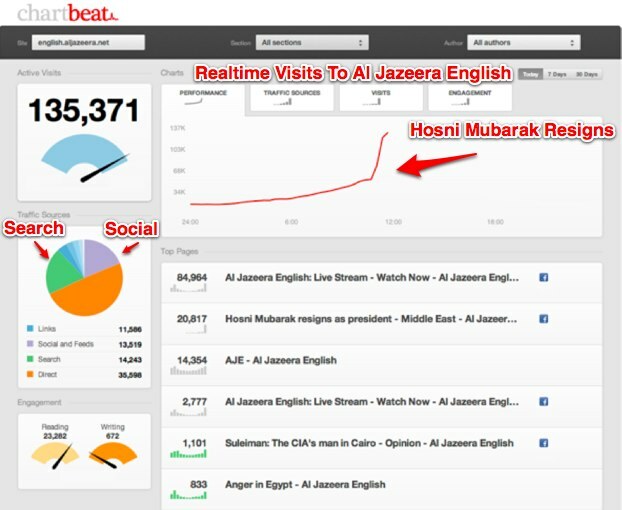 Thanks to Chartbeat, we now have a realtime snapshot of what activity looked like on Al Jazeera’s English website on Friday when Egypt’s president Hosni Mubarak resigned. Everyone wanted to watch and they flooded to Al Jazeera’s English website. Concurrent realtime visits spiked from about 50,000 right before noon ET to 135,371 when the snapshot above was taken. 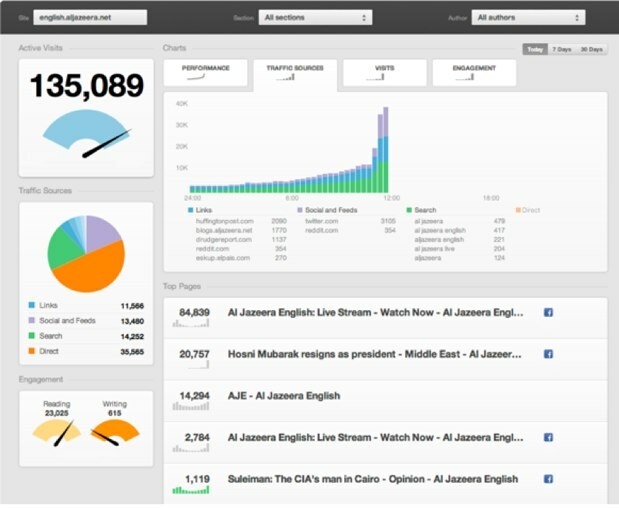 The number of people simultaneously on Al Jazeera’s website kept going as high as 200,000—that was at any given second, and translated into millions of people watching on the Web. (And this was on top of already higher traffic which had risen 2,500 percent earlier during the uprising). 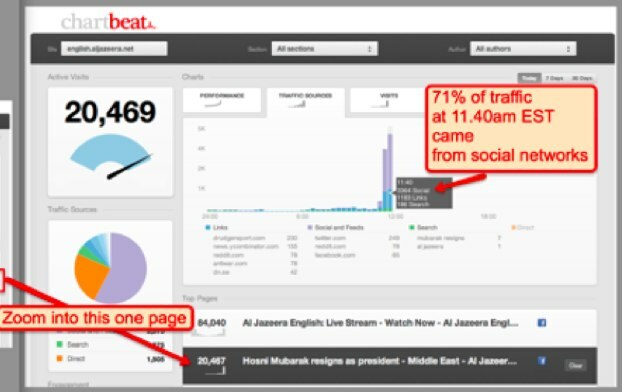 Al Jazeera uses Chartbeat to track realtime visits to its websites, and they allowed Chartbeat to post the screenshots you see here to the Chartbeat blog. In addition to showing the raw number of realtime visitors, Chartbeat can also break them down by source. And here is where it sheds a light on the role of social media in spreading the word and driving people to its coverage of events. If you look at the pie chart in the lower keft-hand corner, you can see that traffic from social media (lavender) was about equal to traffic from search (green), but that is a normalized view over time. If you drill down into the report for the article, “Hosni Mubarak resigns as president,” a full 71 percent of traffic at 11:40 AM ET came from social media (see first screenshot below). The second screenshot below shows a bar chart that breaks up traffic by source across time, and shows how traffic from social media (also lavender) spiked across the site right around noon. And what was the biggest source of social media traffic? It wasn’t Facebook . It was Twitter (followed by Reddit). When it comes to spreading realtime news, the social revolution is very real and Twitter is in the vanguard.